Jenike & Johanson is a bulk material handling, processing, and storage company. It delivers engineered solutions to achieve reliable powder and bulk solids flow based on proven theories and decades of project experience. This is precisely where Jenike & Johanson adds value to the engineering process. The company’s conceptual and functional engineering designs are developed with thorough consideration of representative powder and bulk solids flow characteristics, and provide the critical information to convey the design intent. Using its proven bulk material flow theories, cutting-edge analytical models (simulations of material and equipment interactions), and decades of experience, Jenike & Johanson determines the most cost-effective, safe, and practical designs to correct existing material handling problems, as well as to provide reliable equipment designs for new installations. Peer reviews: review of proposed system design from material flow basis. Jenike & Johanson’s engineers do not only consider typical design parameters such as storage capacity, feed rate, or bulk density. They also focus on vital design factors (e.g., hopper angle, material of construction, outlet size) that will allow the equipment to work functionally from the start and provide decades of trouble-free operation. Jenike & Johanson’s structural group includes engineers with extensive project experience in design and analysis of bulk material storage structures used in power, chemical, mining, food, and agricultural industries. Its group consists of civil and structural engineers who have decades of structural engineering experience factoring in unique bulk material behaviour and external loading conditions such as wind or seismic. Design of support for ancillary equipment attached to silos. Retrofit design for 1,500-tonne-capacity silo handling hot lime at 800° F (427o C) to improve flow reliability. Jenike & Johanson performs structural design calculations, stress and fatigue analysis using its extensive proprietary and commercial software capabilities such as COMPRESS, RISA, and ANSYS®. The company’s engineers have the knowledge and valuable experience to analyse and design storage structures based on critical design loads including all relevant internal (solids and gas pressures) and external conditions. Jenike & Johanson routinely applies its unique structural engineering skills to provide valuable input for customized bulk material handling equipment such as its J-PurgeTM gas introduction system, slide gates, and transfer chutes. Jenike & Johanson has the experienced staff, knowledge, and specialized tools to perform both physical and real-world analytical modelling studies. The company understands the importance of making sure the models are accurately scaled geometrically and with respect to bulk material flow properties. Testing of large particle bulk solids (e.g., coal and switch grass). Analytical modelling capabilities Using proprietary tools developed in-house based decades of bulk material handling research and commercial software such as ANSYS®, Jenike & Johanson has extensive analytical modelling capabilities. Fatigue analysis for connections that are bolted, flanged, and welded. Phoenix Products Company Inc. designs and manufactures superior lighting fixtures for some of the world’s harshest environments and has been serving the bulk and mining industry since the 1950s. Phoenix has always had a reputation for high quality, expertly fabricated metal parts that are designed and manufactured in the USA. This caught the attention of one large mining equipment company in the 1950s. The company was frustrated with years of constant lamp replacement due to extreme shock and vibration on the equipment and as a result, commissioned Phoenix to design a shock-resistant light fixture. The new fixture stood up to the conditions and greatly reduced the amount of lamp replacement necessary. This fixture, the Sturdilite®, was Phoenix’s entry into the rough service lighting industry and was so exceptional that it is still in use today. Today, Phoenix serves many international bulk companies by continuing to engineer and perfect its patented designs. Phoenix offers an impressive line of LED fixtures, which allow customers to dramatically increase lifespan, decrease maintenance costs and significantly reduce energy consumption. All Phoenix fixtures are backed by competitive warranties and supported with outstanding customer service and technical expertise. Phoenix lights are still designed, engineered and manufactured in the USA with a focus on quality and durability. The new HDL-LED Series is a great example of the heavy duty composition of a Phoenix light fixture. Phoenix uses marine-grade extruded aluminium housing and an anodized finish for additional protection against corrosion. The HDL-LED also utilizes a replaceable, impact-resistant and UV-stable lens, as well as a conformal coated circuit board, fully potted driver and 316 stainless steel hardware. The HDL-LED features a versatile, compact design and provides the essentials for most bulk equipment applications including several output levels, optic options and emergency battery backup. The standard fixture is designed for surface mount, conduit mount and continuous row mount. It is ideal for electrical and machine rooms, access way and conveyor illumination and other areas of the machine that are difficult to access. The HDL-LED Series provides 30W, 60W and 90W configurations delivering 3,000, 6,000 and 9,000 lumens, respectively.The fixture features an AC or DC driver with a dimmable option. The HDL-LED carries a five year limited warranty. It is ETL certified to UL 1598 and 1598A with a pending UL 844 (Class I, Div II; Class II, Div I & II; Class III) listing. As is typical with Phoenix fixtures, the HDL-LED is designed to be easy to repair in the field. Repair parts are available for purchase. The HDL-LED Series provides significant maintenance reduction, energy savings and instant-on lighting. These features help reduce downtime and significantly increase safety on the equipment. CST Covers, through its heritage as Conservatek and Temcor, has supplied thousands of aluminium geodesic domes to the bulk storage market for more than 50 years. CST Covers has completed over 16,000 projects in over 90 countries worldwide. CST Covers’ geodesic aluminium domes are uniquely designed for each application, taking into account the specific storage and operational requirements of equipment involved in the handling or processing of the stockpiled material. Structurally efficient and lightweight, clear-span aluminium domes maximize bulk storage capacity, minimize foundation costs and provide dependable protection from the elements while remaining virtually maintenance-free. CST Covers strut and panel system mechanically locks the panels securely into place, incorporating a seal with a fully engaged gasket. This design is the key to being able to provide effective water and gas tight domes. The closure system features aircraft quality tolerances in the manufacturing process. The system ensures a long term reliable seal. CST Covers uses silicone for its batten seals. Silicone is an inert material not affected by ultra-violet light. dimensional needs with sizes up to 320 meters in diameter.They can be designed to enable installation of stacker/reclaimers, allow conveyor/truck entries and be used for storage of most dry bulk material.The unique space truss design and highly engineered components combine to make CST aluminium domes the ideal solution for challenging environmental enclosure and bulk storage problems.Whether it’s keeping the elements out or getting the largest amount of bulk in the smallest amount of space, this solution has proven itself time and again. CST also offers custom aluminium vaults which can be designed to meet the demands of almost any bulk storage application. CST vaults are designed to accommodate many different reclaimer system used in bulk storage facilities. Contact CST Covers today with your specific application information and let our team of professional engineers custom design a solution that is functional, flexible and provides you with a low maintenance solution that will last a lifetime. Martin Engineering is helping conveyor users reduce operating costs and improve safety with inspection and maintenance programs designed specifically for each individual system. The Walk the BeltTM programme from Martin Engineering provides regularly-scheduled reviews of belts, cleaners, tracking, chutes, dust control and other components from experienced specialists with the training and expertise to maximize productivity and reduce downtime. Featuring immediate transfer of data and photos to facility managers, the programme establishes an evolving record of each belt for current analysis and future reference. By taking responsibility for routine maintenance and identifying potential issues before components fail, technicians assist customers in maintaining system performance and extending service life, while minimizing fugitive material and unplanned shutdowns. Conducting conveyor inspections and maintenance can pose significant risks to employees, as these activities bring workers into close proximity with the conveyor system under potentially dangerous conditions. Staff members are exposed to moving belts, rolling components and pinch points, all in an environment that is commonly dirty, distracting and noisy. Outsourcing those functions to trained professionals will relieve system managers of the burden. As plants across many industries struggle with staff reductions, some facilities now entrust some or all of their conveyor equipment installation and maintenance work to outside contractors. The approach keeps maintenance management in the hands of the plant, while outsourcing the actual labor. Fugitive material management is a key element of the inspection programme, and one of Martin Engineering’s specialties. As problems from the creation, accumulation or escape of dust are multiplied by the increased possibility of regulatory citations, fines and shutdowns, it’s imperative that plants prevent the escape of fugitive particles. A key to minimizing the release of dust is the proper maintenance of components such as belt cleaners, transfer point seals, dust curtains, suppression systems and air cleaning equipment. Proper adjustment and timely service will minimize carryback and dust issues all along the conveyor. The Martin Engineering technicians do more than walk along the length of the belt, of course. In fact, one of their inspection techniques is standing stationary at a number of points along each conveyor and watching one or more complete revolutions of the belt, noting its condition, tracking, carryback and other observations. They take detailed notes, identifying trouble spots by component name and location as they are found, often logging data directly into a smart phone or tablet immediately at the site. Digital cameras and other devices allow the technicians to take photos, record video, make rough measurements and perform other tasks, then share a wealth of information with customer operations personnel for discussion and prioritizing. Maintenance and repair tasks can be included in the programme and performed routinely, or scheduled upon request. Martin Engineering professionals can also provide a comprehensive survey of the entire plant’s material-handling system, including measured levels of respirable and fugitive dust and spillage. This report delivers grid-based results, giving the client real information that can be used to prioritize needs and avoid misplaced spending. “A conveyor is a complex system of interlinked components,” Strebel reminded. “If even one component or subsystem stops functioning, processes both upstream and downstream will be affected, potentially leading to a shutdown or worse. In a large and dust issues all along the conveyor. The Martin Engineering technicians do more than walk along the length of the belt, of course. In fact, one of their inspection techniques is standing stationary at a number of points along each conveyor and watching one or more complete revolutions of the belt, noting its condition, tracking, carryback and other observations. They take detailed notes, identifying trouble spots by component name and location as they are found, often logging data directly into a smart phone or tablet immediately at the site. Digital cameras and other devices allow the technicians to take photos, record video, make rough measurements and perform other tasks, then share a wealth of information with customer operations personnel for discussion and prioritizing. Maintenance and repair tasks can be included in the programme and performed routinely, or scheduled upon request. Martin facility, even a fraction of a percent of system availability could be measured in millions of dollars,” he added. Martin Engineering supplies bulk material handling technology and equipment around the world for a wide variety of applications, including mining and coal handling, cement/clinker, rock/aggregate, biomass and other materials. Founded in 1944, the firm is headquartered in Neponset, IL, offering manufacturing, sales and service from factory-owned business units in Brazil, China, France, Germany, Indonesia, Mexico, South Africa,Turkey, India, the UK, Japan, Russia, Peru and under exclusive licence with ESS Australia. Dos Santos International has been awarded a contract near the Gulf of Mexico, which includes engineering support and supply of a DSI Snake Sandwich High Angle Conveyor — the widest belt width, highest volumetric rate DSI Snake to date. Dos Santos International has long provided expert engineering support to a major transfer terminal on the Mississippi River delta, North American Gulf of Mexico. Barge tows of coal and coke from all over the USA travel south on the Mississippi River to the terminal where they are unloaded to storage. The stored material is later reclaimed and loaded into ships that deliver the coal and coke to power plants, steel mills and chemical plants, along the Gulf coast and all over the world. The terminal transfers 20 to 30 million tonnes annually. When built in 1965 the terminal consisted of a bucket ladder type continuous barge unloader (CBU), a storage yard, served by a reversing yard belt with a bucket wheel type stacker reclaimer (S/R), and a slewing, luffing and telescoping type loader for Gulf barges and small ships. The main market was the power plants along the North American Gulf coast. Additional down river dock structure was later added along with clamshell type unloading equipment to handle specialty materials. International coal trade increased dramatically through the 1970s. A major expansion of the terminal, in the early 1980s sought to capitalize on the increased coal trade. A second, parallel, but higher capacity system was added just up-river from the first. The new system included a double bucket ladder, pivoted arm type CBU, a storage yard served by a reversing yard belt with a bigger, higher capacity stacker reclaimer (S/R) and a new travelling, luffing, telescoping ship loader on a new dock structure between the two storage yards. The new travelling shiploader could easily load large ships. Parallel tripped conveyors at the new dock, one running up-river, the other down-river, allowed the shiploading of the coal from either yard. Other than sharing the common ship loader, the two storage yards remained isolated from each other depending entirely on the availability of their local equipment. At each stockyard it was not possible to simultaneously stack and reclaim. 1. An additional parallel reversing yard belt at each storage yard, served by the yard’s stacker reclaimer. a. Either yard belt tripper can feed the S/R to stack-out b. In reclaim mode, the S/R can load either yard belt. through a bifurcated chute with actuated flop gate. a. Each stacker has a reversing boom conveyor that can stack to either side of the track. b. Each stacker is loaded by either of its two yard belt trippers. 3. Up river and down river conveyors to direct material flow from either CBU to either storage yard or from reclaiming at either yard to ship loading via either end of the main dock 4. Three new slewing, telescoping shiploaders, located downriver of the main dock. These new shiploaders, though stationary, are designed with the combined operating range to load large ships without repositioning. The isolation is ended with the new up-river and down-river conveyors that link the two storage yards. To preserve maximum stacking range along the yards the up/ down-river conveyors must hug the CBU dock line, locating them alternately over land and over water. The original yard belts are broken into two flights at the respective junctures with the up/ down-river conveyors. Thus, from either CBU, material flow can be alternately directed to either storage yard for stack out or directly to any of the shiploaders. The new expansion maximizes flexibility allowing continuous stack-out at either or both yards with simultaneous continuous reclaim to ship loading from either or both storage yards. This flow path flexibility is facilitated through elaborate junctures of high-tech control flow chutes, particularly at the ends of the new up/down river conveyors. These transfers are contracted separately to the control flow specialists of Power Techniques of Alma, Illinois, USA and M & J Engineering of Germiston, South Africa. These control flow chutes are well known in the trade as Weba Chutes. The current expansion afforded the opportunity to establish better environmental controls and to better deal with nagging operational issues. These are related. Whereas conventional open troughed belt conveyors can ideally operate at inclines as high as 15° to 17°, practically, variations in material characteristics can greatly affect this, significantly lowering the incline angle. Barged coal often arrives in very wet condition. The barges may have been loaded with wet coal and/or the open barges may take on additional moisture from long exposure to downpours of rain. In transit, excess water tends to gravitate to the bottom of the barge. When unloaded by the bucket ladder type CBU, the first ‘hogging’ pass delivers a moist coal mix but the final pass drags the barge’s bottom and bails the excess water. In many cases such a wet material/free water mix cannot be conveyed at any significant incline and tends to run back, spilling from the conveyor. Operational and design parameters for the terminal expansion were developed from such experience. As a result: 1) conveyor incline angles are limited to 9° throughout the terminal; 2) All new elevated conveyors are to have full length drip pans to catch any spillage so that wash-down can direct it to a strategic collection point. These two mandates promise to improve the environment at and around the terminal. The new system layout required a new conveying path from the downriver CBU to the new down-river transfer complex. The direct path to discharge over the down river yard belts subtends an incline angle that far exceeds the capability of any conventional open troughed belt conveyor. The reflexive solution was to use two conventional conveyor flights in a switch-back arrangement. The 9° maximum incline limitation and the location over water made this a costly proposition. The large (environmental) footprint was also a negative. Because of the long relationship with Dos Santos International, terminal personnel knew there was a better solution: a DSI Snake Sandwich High Angle Conveyor. At 3,629tph (tonnes per hour) [4,000stph] of coal this will be the highest volumetric rate to date for a Dos Santos Sandwich Belt High Angle Conveyor. The Terminal management, in their due-diligence, sent key professionals to visit the operation of Dos Santos Sandwich units handling coal at high volumetric rates. These visits, and discussions with operating and maintenance personnel, confirmed that the DSI Snake was the best solution. The DSI Snake was ordered in April of 2014. Presently in engineering, the high angle conveyor will deliver by year end and will begin operation in early 2015. 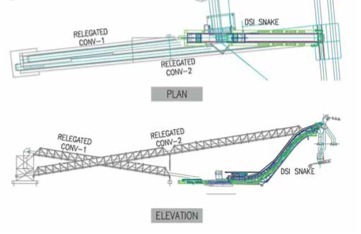 The new DSI Snake profile is depicted in Figure 1 along with the alternate conventional conveyor solution for contrast. Figure 2 shows the Snake arrangement along with a summary of the design specifications and features. At 2,438mm (96”) of belt width this is the widest Dos Santos Sandwich Belt unit. The Snake is part of the coal flow path from the original down-river CBU to the top of the new downriver transfer tower. The bucket ladder type CBU unloads the coal from the barges and discharges it onto the gathering ‘A’ conveyor, which discharges to the connecting ‘B’ conveyor. The DSI Snake receives the coal load from the B-conveyor discharge and elevates it continuously up to the transfer tower, for distribution to the alternate terminal destinations. The CBU travels up and down the support tower as required; to clear the empty barge at the highest river level and to dig into the fully loaded barge at the lowest river level. Thus the tail of the connecting B-conveyor follows the CBU travel while the head end pivots to the resulting incline angle. The material discharge onto the DSI Snake unit will vary accordingly. Special features of the Snake include galvanized steel structure, corrugated covers and wind guard, and a full length stainless steel drip pan to a strategic discharge point at the foot of the inclined structure. Naturally, at 52° incline the drip pan will be self-cleaning. Additionally the bottom belt tail end is extended back, behind the loading area, in order to facilitate belt splicing. The lower end of the Snake will be largely supported on existing structure while the main incline structure will be supported on a new pile group at the bottom and on the new transfer tower at the top. A pair of smaller piles will support the bottom belt take-up area. The DSI Snake Conveyor will be a substantial improvement over the switch-back conveyor arrangement originally conceived. Its use will eliminate a transfer, along with the substantial additional tower and foundations that would be required to support the switch-back transfer. Its shorter path and material containment will further limit the environmental impact of the material handling system. These, among other benefits of the DSI Snake, make this unit an ideal solution for this application. This latest order is proof of the continued growth and confidence in the DSI Snake Sandwich High Angle Conveyor technology and its many advantages. Martin Engineering, specialist in conveyor safety technology offers a suite of products and services to protect workers from fast-moving rollers and belts, helping bulk material handlers maintain safer and more productive operations. The components and training from Martin Engineering can be used alone or together to help prevent accidents and injuries, reducing risk while benefiting productivity. Designed to prevent workers from being drawn into a moving return roller, the Martin® Return Roller Guard is an economical way to raise safety awareness and reduce injuries. The solid upper section delivers pinch point protection, and the slotted lower area allows visual inspection while preventing contact with the roller. Installation is straightforward, with brackets included to mount the guard directly to either the side or bottom of the stringer. Quick-release pins allow easy service, with side and bottom panels that swing open for cleaning or maintenance, and removable end plates provide access to roller bearings. The guards are designed to fit all major roll manufacturers’ sizes (CEMA C, D & E). Installation is recommended on all return rollers that are less than 7 feet (2.13 metres) from the ground, or in locations where the roller is otherwise within reach of workers. The Martin® Return Roller Basket is designed to prevent a return roller from falling in the event of a mechanical failure, recommended for rollers that are more than 7 feet (2.13 metres) off the ground and out of reach for any workers. The combination of guards and baskets provides a systematic approach to conveyor guarding that’s easy to use and safety compliant. Like the Return Roller Guard, slotted panels allow easy inspection, while keeping workers protected. Brackets designed to fit all major roll manufacturers’ sizes are included to mount the basket directly to either the bottom or side of the stringer. Quick-release pins allow easy access, and side panels swing open from either top or bottom for cleanout or service. Both the roller basket and guard are available in painted steel and two grades of stainless steel. Martin® Conveyor Guards simplify conveyor guarding to improve plant safety and productivity. The heavy mesh guards allow easy inspection, while keeping moving components and pinch points isolated from workers. The rugged modular design is supported by a supplied angle iron structure, and attachment to the conveyor equipment is not required. Installation is straightforward, with wedge clamps that allow panels to be removed and re-installed quickly. The guards conform to OSHA 29 CFR 1910.217 when installed with a minimum of 5.5 inches between the guard opening and hazard. Available in a range of sizes from 24” x 24” (610mm x 610mm) to 36” x 50” (914mm x 1,270mm), they feature a universal design that can be used in a variety of combinations to fit almost any application. Systems can be easily expanded or relocated as needed. Martin Engineering has expanded its FOUNDATIONSTM Training Program on the design and development of more productive belt conveyors to offer three customizable seminars. Training is available to suit individuals with varied levels of experience and responsibility from new hire to senior engineer. Attendees attain a better understanding of conveyor safety and performance, helping to justify upgrade investments and increase profitability. The FOUNDATIONS Workshop series has been teaching bulk-materials handling personnel how to operate and maintain clean and safe belt conveyors for nearly twenty years. All programmes offer the opportunity for customization/localization to feature specific images, conditions and problems from the customer’s site. Programmes are flexible as far as location and length. The presenters are highly trained and have many years of hands-on experience around conveyor systems. These industry experts keep the programmes lively and interesting, while giving attendees a new outlook on conveyor operations. Martin Engineering supplies conveyor products and industrial vibrators around the world for a wide variety of bulk material handling applications, including cement/clinker, rock/aggregate, coal, biomass, grain and other materials.